When DailyKos publisher and owner Markos Moulitsas demanded that his pollster produce raw data from the polls Moulitsas purchased, he established a principle of election polling transparency that could open up the checkered history of presidential elections in the United States. When R2000 either refused or delayed (there's disagreement on that), kos took their actions as a sign of "fraudulent polling practices" (from the kos lawsuit). DailyKos published a searing criticism of R2000 and the National Council on Public Polls supported kos in his demand that R2000 release the raw polling data. Blogger Nate Silver of FiveThirtyEight.com and the New York Times supported kos, as well. The request by kos is well justified. He'd paid for the polling. Like any customer in this type of arrangement, he had a right to the product of the work done in his behalf. Reviewing the basis for the polling results, particularly the raw data and the analytic methods, could answer two key questions: 1) were the polls actually conducted and 2) did the techniques used meet the professional standards of other polling organizations. We don't know how the law suits will turn out. But without much doubt, the raw data will be released at trial or during the discovery phase. But there is a much bigger case for releasing raw polling data, one that has a profound impact on our history as a nation. That raw data, requested time and again, is the polling data from the 2004 National Exit Poll, sponsored by a consortium of mainstream media organizations (Associated Press, CNN, ABC, NBC, CBS, and Fox). The 2004 election was marred with controversy throughout the country. Florida and Ohio received the most attention. Had Democratic candidate Senator John Kerry won Ohio, he would have achieved an Electoral College victory. This had an enduring impact on public confidence in the 2004 presidential election. By September 2006, only 45% of registered voters surveyed were "very confident" Bush won election "fair and square." The situation in Ohio was so questionable, an ad hoc congressional hearing was held to examine the irregularities. Current House Judiciary Committee Chairman John Conyers (D-MI) led the congressional delegation. He presented his findings in the report, Preserving Democracy: What Went Wrong in Ohio. Conyers made requests for the 2004 exit poll raw data but was turned down (Congressman wants 'raw' exit poll data). Without that critical raw data, the results in Ohio and nationwide could not be fully reviewed and analyzed. 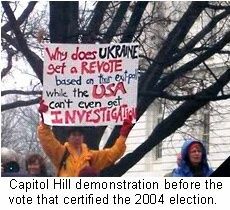 Others including Richard Charnin (TruthIsAll) in (Proving Election Fraud), Michael Keefer, Mark Crispin Miller, Steve Freeman, and the Election Defense Alliance provide compelling arguments to question 2004 and subsequent election results (see Landslide Denied, 2006). But like the Rep. Conyers and his 2004 inquiry, they were not allowed to review raw exit poll data from 2004. View All 17 Articles in "Election fraud"